Soft gray and white towels and neutral-toned bath accessories meld with the overall palette. A small space can be just as restorative as a large one ― and color is the main ingredient for setting a peaceful mood. In Brian and Amy Fleisher’s bungalow bathroom in Seattle, the mix of materials is limited to two colors: cool blue (which is calming and evokes natural elements) and warm cream (which suggests coziness and comfort). The effect is the visual equivalent of a long, cool drink of water. Soothing hues and clean lines result in a room that seems larger than its roughly 6- by 9-foot area. The blue tint of the frosted-glass shower surround stays in step with the wall color, while the translucency of the glass allows light into the shower and adds to the open feel. Reflective and high-gloss materials ― like the off-white subway tiles on the vanity backsplash and shower wall ― further amplify natural light. Making room for storage keeps clutter at bay. Opposite the shower in this bathroom, a low row of open shelving (carved from unused space in the adjacent, low-pitched attic) makes a handy spot to store towels. Keeping accessories ― like faucets, cabinet pulls, towel rings, and mirrors ― simple creates a visually restful scene and prevents small elements from upstaging the overall mood of the room. Info: Design, Anna Labbee, J.A.S. Design-Build, Seattle (206/547-6242). Resources: Misty Morn paint (item C2-234 P) by C2. Martinique 3- by 6-inch tile in Biscuit from American Olean. Bancroft faucet in chrome and porcelain and Caxton undermount sinks from Kohler. Aquamarine candle by Nina Campbell ($49) and square marble charger ($45) from Great Jones Home. White canister (as vase) from Restoration Hardware (800/762-1005). 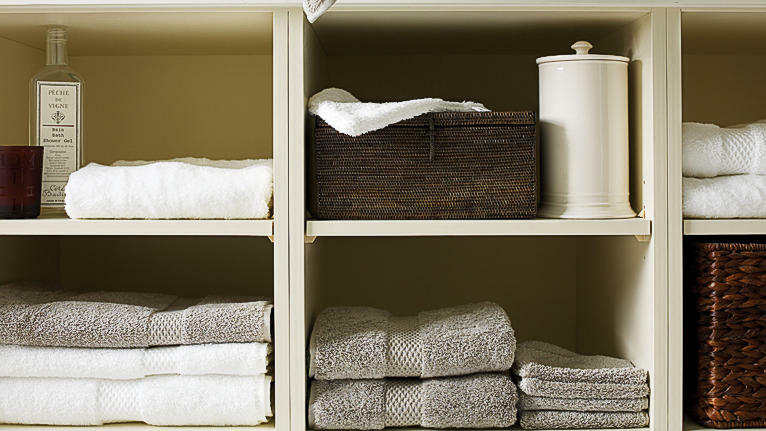 Guest soaps ($3) and Etoile towels ($10-$96) from Yves Delorme (800/322-3911). Amber-scented Homer candle from Great Jones Home ($49; see above). Côté Bastide Pêche de Vigne bath and shower gel from Watson Kennedy ($44). Tava paper holder (brown woven basket) from Pottery Barn ($36). White canister from Restoration Hardware (see above).